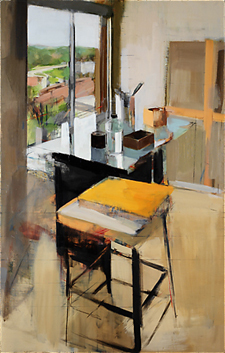 Peri Schwartz is a New York-based artist whose powerful paintings, prints and drawings are said to blend realism and abstraction with predominating angles, shapes and lines. Her work is included in many public and museum collections including the British Museum, the Museum of the City of New York, the Corcoran Gallery, the Fogg Art Museum, the Boston Museum, the Bibliotheque Nationale de France, and the New York Public Library. She is interviewed here by Harryet Candee, editor/publisher of The Artful Mind. I always knew that I wanted to be an artist and was fortunate enough to have support from my family. 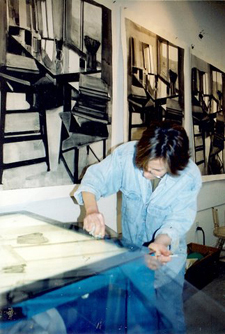 I studied at Boston University School of Fine Arts and received a Masters of Fine Arts at Queens College. It was at BU that I learned about composition, anatomy, and that discipline is a crucial part of being an artist. I hesitate to use the word realism about my work, although I work directly from my subject matter. Composing the image and figuring out how the image fits into the edges of the work are ultimately more important to me than making something look real. At Boston University we drew, painted and sculpted from the model. We also spent a lot of time studying the Old Masters. I did (and continue to do) drawings from paintings by Velazquez, Rembrandt, van Dyck, Degas, and other masters that are particularly important to me. When drawing from reproductions, I put a grid over the image to facilitate my copying of the image. The grid emphasizes the dynamics of the compositions. It is like looking at the skeleton of the painting, exposing all the verticals, horizontals and diagonals. What is especially impressive is how the masters created depth and form while constructing a brilliant composition. For example, the placement of an arm in a Degas drawing is as much about a diagonal as it is about expressing the form and movement of the dancer. For many years I did self-portraits and used the Old Master paintings as a way to guide me in setting up the composition. I also did many still lifes and eventually realized there were more possibilities for abstraction in working from a set-up than looking at myself in the mirror. What is your opinion of Kasten Fine Art? I was very fortunate to learn about Kasten Fine Art from Robert Kipness, an artist I met at the Center for Contemporary Printmaking in Norwalk. He was very generous and recommended me to then. When I brought some of my work up to show the gallery, we felt an immediate connection. It is always interesting to see the other work they are showing and I liked the way the space allows for both intimate and larger work to be viewed. Who has been your mentor or inspiration in art? Music and literature are great sources of inspiration for me. The Emerson Quartet recently did a series of Beethoven Quartets in Context at Carnegie Hall. I love the music they played, and when I got back to my studio I listened to what they performed. I guess somehow I am trying to connect the intensity of feeling I have for the music to my work. I also read and listen to books on tape and find my appreciation for great work somehow informs what I do in the studio. How did you spend your most favorite seasons when growing up? My best memories were the two summers that I spent in the Berkshires. BU had a program at Tanglewood and I received scholarships to study there. I had never been to the Berkshires and it was as if the floodgate opened. In one of the most beautiful settings imaginable we were learning about drawing and painting. The teachers were terrific, the students were serious and also loved to swim and play, and we heard the Boston Symphony rehearse while we worked. Favorite and least favorite medium to work in, why, which. How? Working in different mediums is important for me. Thinking in black and white is a way to clarify a visual idea. By eliminating color I can focus on the composition and the light. There is also a directness and immediacy to drawing that allows for great freedom. When I return to painting after drawing, color becomes the subject and I don’t worry as much about defining everything. Making prints, especially monotypes, is a medium I am fascinated with. For the past couple of years I have worked with the master printer, Tony Kirk, at the Center for Contemporary Printmaking in Norwalk. Collaborating with Tony is exciting because I learn about different ways to get to the image I want. With his help we have developed a way to rework a print by running it though the press several times, allowing me to make corrections and strengthen the darks. One of the joys of printmaking is the sense of adventure and surprise in seeing the print for the first time. What is your dearest motto, philosophy, or message for yourself? This quote from Willa Catha keeps me going. "Every artist knows there is no such thing as ‘freedom’ in art. The first thing an artist does when he begins a new work is to lay down the barriers and limitations; he decides upon a certain composition, a certain key, a certain relation of creatures or objects to each other. He is never free, and the more splendid his imaginations, the more intense his feelings, the farther he goes from general truth and general emotion. Nobody can paint the sun, or sunlight. He can only paint the trick that shadows play with it, or what it does to forms. He cannot even paint those relations of light and shade – he can only paint some emotion they give him, some man-made arrangement of them that happens to give him personal delight – a conception of cloud over distant mesas that makes one nerve in him thrill and tremble."